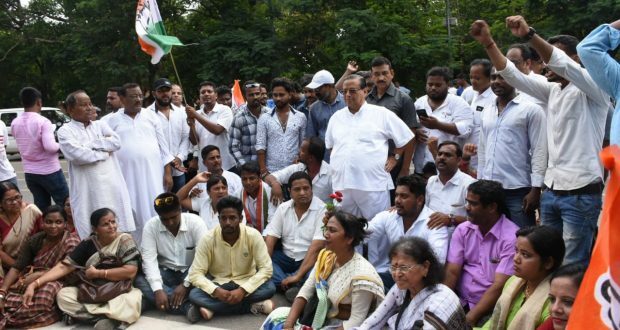 Bhubaneswar:10/9/18 :Normal life was thrown out of gear in the state following the nine-hour Bharat bandh observed by the Congress today in protest against the steep hike in fuel prices by the BJP government at the Centre. The bandh which began at 6 am will continue till 3 pm. The impact of the bandh was felt in the twin cities of Bhubaneswar-Cuttack. To maintain law and order situation, at least 20 platoons of police force have been deployed at various key points in the city. In addition to that, senior police officials have been deployed on duty to keep strict vigil on various sensitive places. 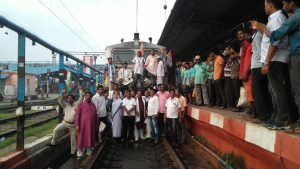 As many as 10 trains have been cancelled by the East Coast Railway (ECoR) following Bharat bandh observed by Congress and other political parties today over rising fuel prices. 58425/58426 Kendujhargarh-Bhubaneswar-Kendujhargarh Passenger from both the directions. 58407 Bhadrak-Bhubaneswar Passenger from both the directions. 58411/58412 Bhubaneswar-Brahmapur-Bhubaneswar Passenger from both the directions. 58535/58536 Cuttack-Paradeep-Cuttack Passenger from both the directions. 58436/58435 Cuttack-Bhadrak-Cuttack Passenger from both the directions. 22819/22820 Bhubaneswar-Visakhapatnam-Bhubaneswar Inter City Express from both directions. 58424/58423 Cuttack-Bhadrak-Cuttack Passenger from both the directions. 18303/18304 Sambalpur-Puri-Sambalpur Inter City Exp from both the directions.